web.config missing when creating ASP.NET Core Web App in VS 2017 RC? I've noted that when creating a new ASP.NET Core Web App in Visual Studio 2017 RC, a web.config file is not created. My understanding was that this file contains important code to facilitate IIS integration, something that I am interested in, as I would like to run this application on IIS. Is this a bug, or have I missed a step in the process? In ASP.Net core we do not have web.config rather we have app.config file. In ASP.Net Core configuration has been changed a lot, now packages are managed via Package.json file. 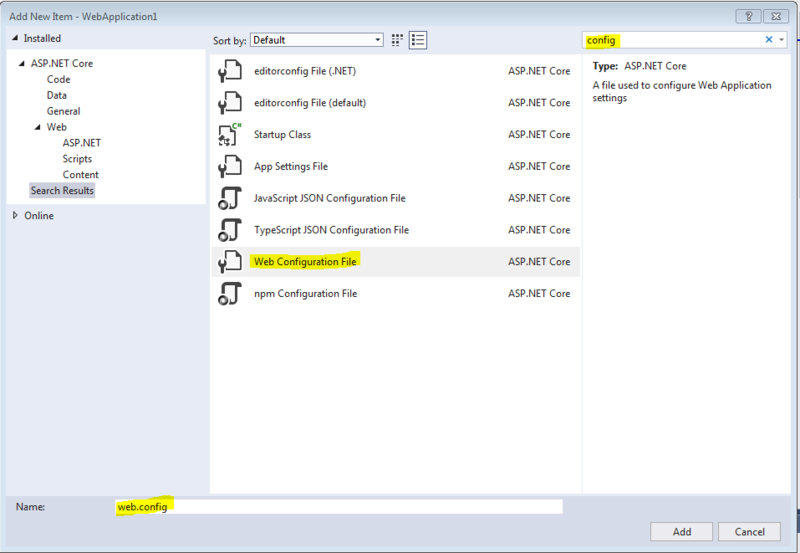 In case you need to store some app related configuration then you can use appsetting.json file. For Asp.Net Core 2.0, and you still need to have web.config you can add a Web configuration item template. You can use that like change the max file upload limit etc. The web.config file is generated when you are publishing the project. In Visual Studio 2017, right click in Project in Solution Explorer -> Add -> New Item -> Search for "config" -> Add Web Configuration File. This will add web.config in your project with default stuff. This isn't a direct answer to your question, but I want to post this solution, as it is related. Today, I found that VS2017 refused to start my web app as it said it couldn't find a web.config file. The error message showed the path where it was searching for the web.config in, but it was a folder that had never existed on my laptop (I'd been sent the code from an external company). Even worse, our project didn't even contain a web.config file, so the error made no sense !! I just had to increment the port number which my code was running under. Again, apologies - this isn't a direct answer to the question, but I'm sure I won't be the only person to stumble on this webpage, after receiving this bizarre "Can't find web.config" error, so I think it is useful to document here. Not the answer you're looking for? Browse other questions tagged asp.net-core visual-studio-2017 or ask your own question. What Visual Studio 2017 option is required to create an F# ASP.NET Core Web Application?